Trying to stay on top of health- and wellness-related news and events can be overwhelming. It’s a lot to digest (pun intended). We saved you the trouble. 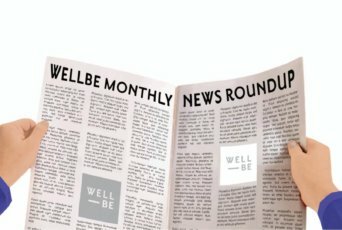 Here’s the top health news from August + September, WellBe-style. What: The American Academy of Pediatrics issued a statement urging parents to lower children’s exposure to chemicals in food by limiting use of plastic food containers and avoiding processed foods. The Details: The American Academy of Pediatricians released both guidelines and a technical report, both of which add to a growing body of scientific evidence that certain chemicals that enter foods can have long-term health effects on children. They specifically called out nitrates and nitrites, used in processed meat products; phthalates, used in plastic packaging; bisphenols, used to line metal cans; perfluoroalkyl chemicals, used in grease-proof packaging; and perchlorates, an antistatic agent used in plastic packaging. The group encouraged families to avoid processed foods and choose whole fruits and vegetables as much as possible, while also calling for more rigorous testing and regulation of the chemicals that go into or touch our food. Around the same time, a separate but related report out of UCSF found dozens of chemicals called environmental organic acids (or EOA’s), in the blood of pregnant women. These chemicals, which had never before been found in pregnant women, can also be traced back to plastic packaging. EOA’s have similar structures to hormones, causing them to disrupt the endocrine system of the fetus. Why Does This Matter for My Health? If you have kids, are thinking of having kids, or have kids you care about in your life (aka, everyone), this is really serious. The chemicals named by the pediatrician’s group have been shown to contribute to childhood obesity — which has more than tripled in the U.S. since the 1970’s — as well as hormone disruption.The unfortunate truth is that we’re all exposed to chemicals, but infants and children are extra vulnerable, partly because they eat more food per pound of body weight than adults, and because their metabolic systems and key organs are still developing, which means that these hormone disruptions can cause lasting damage. In terms of pregnant women, the chemicals are equally worrisome, as they can interfere with the development of the fetus by disrupting its endocrine system. Some of the chemicals are also linked to genetic defects, fetal damage, and cancer. The WellBe Takeaway: We always encourage eating whole, organic foods over processed ones, partly for the reasons outlines in these studies. No matter how much label-reading you do, you can never be sure what chemicals are hiding in processed food products. We also believe that how you carry your food is just as important as the food itself. While the lead author of the study recommends wrapping food in wax paper in lieu of food-grade plastic containers, we prefer to go the low-waste, zero-chemical route with reusable glass or metal food containers. $289 MILLION AWARDED IN MONSANTO TRIAL — HISTORIC VERDICT! What: A jury awarded $289 million in damages to Dewayne Johnson, who claimed that his terminal cancer was caused by Monsanto’s Roundup weed killer. The Details: Dewayne Johnson was a former school groundskeeper, and so Monsanto’s Roundup and Ranger Pro herbicides, which both contain the chemical glyphosate, were a major part of his life. He applied them upwards of 30 times a year, including two incidents in which he was doused with the product. Yes, doused. Two years after the first incident, Johnson was covered in lesions and given the diagnosis of non-Hodgkins lymphoma. Johnson, a 46-year-old father of two, attributes his cancer to agrochemical behemoth Monsanto, who he claims knew about glyphosate’s risks of cancer. There has been conflicting information on glyphosates up to this point, with the EPA saying in 2017 that they are not likely carcinogenic to humans (but…take a look at #7 for some other questionable assertions by the EPA) after the WHO issued a 2015 statement asserting that they are. Internal Monsanto documents released last summer suggest that the WHO is right: the documents not only exposed Monsanto’s efforts to influence news coverage, they also brought to light internal debate and ethical objections over the safety of Roundup. Note that Johnson’s Roundup trial is separate from the consolidated proceedings going on in Missouri, Delaware, and California, which encompass some 2,000 similar cases. Monsanto has said it will appeal the verdict in Johnson’s case. Why Does This Matter for My Health? Glyphosate, the main ingredient in Roundup, was first approved as a weed killer in 1974 — and since then, it has become the world’s most popular and widely used herbicide. That means that if you’re a gardener, or have a lawn (or play in a park or golf course frequently) that is treated with chemicals, you should make sure you’re not being exposed to this lethal chemical. The WellBe Takeaway: This historic verdict, along with a report released in August of glyphosate found in Cheerios and Quaker Oats — and back in July 2017, in Ben & Jerry’s pints! — reminds us that this chemical is everywhere, even though it’s only been in existence for 44 years. The previously unknown (and, it seems, intentionally buried) research on long-term health drives home how important it is to work hard to avoid glyphosate. We do our best by sticking with mostly whole, organic foods, and EWG-approved products like this bathroom cleaner. What: Two new studies rank different sports based on their health outcomes, with tennis being the best for longevity and team sports like soccer the best for mental health. The Details: The Copenhagen City Heart Study followed 8,577 participants for up to 25 years, looking at the sports they played and how those sports influenced their longevity. The study, which took into account relative risks of each participant, had some pretty fascinating results, showing striking differences in longevity for different sports. The best sport was tennis, adding 9.7 years to your life as compared to the sedentary group, followed by badminton at 6.2 years (which begs the question: how many people are playing badminton in Copenhagen?!). More solitary exercises done in a gym still improved longevity, but less markedly: calisthenics added 3.1 years, and health club activities, 1.5 years. Another study, published in The Lancet, focused on mental health rather than longevity, and came up with a similar but slightly different ranking. They found that team sports had a more positive impact on mental health than physical activities often done alone, like running or walking. Those who played team sports like soccer and basketball reported 22.3% fewer poor mental health days than sedentary people, compared to 19% for those who ran or jogged. Practitioners of yoga and tai chi, which are often done in groups, also fared well, reporting a 22.9% reduction in poor mental health days. This may be because team sports provide the extra benefit of a social component, while yoga and tai chi promote mindfulness, a helpful skill for mental health. Why Does This Matter for My Health? We all know that we should exercise, but life gets busy and it’s easy to put off — plus, if you’re not trying to lose weight or train for something, why does it really matter? These studies drive home the benefits of physical activity for mental health and longevity. It’s not just about getting toned abs, it’s about improving your overall well-being, both mentally and physically. Plus, if you suffer from depression or anxiety, exercise has been shown to work better than antidepressants alone. The WellBe Takeaway: These studies highlight some interesting points about the ways that different types of exercise can affect your physical and mental health. We’ll certainly take that into account when we consider our different workout options, but our biggest takeaways from both studies is that social connection is hugely important, and that every kind of physical activity showed improved health outcomes over the sedentary control. That means we’re not going to force ourselves to play tennis or become a yogi if our true love is running or cycling — we’re going to listen to our bodies, move them as much as possible, and make sure that if our preferred sport doesn’t provide a social connection or promote mindfulness, we find those elements elsewhere. But based on these studies, we’re thinking a weekly mix of an interactive, cardio-focused sport (or at least a workout class you love!) and a yoga or tai chi routine will help improve both our longevity and mental health. What: New research shows a link between estrogen and migraines, which is a big break in the puzzle surrounding the root cause of migraines. The Details: The research, published in Frontiers in Molecular Biosciences, used lab and animals studies to draw a link between estrogen and a heightened risk of migraines. What they found was that as levels of estrogen change, they can cause cells around the trigeminal nerve, which is the largest cranial nerve and is responsible for facial sensation and motor functions, to become more sensitive to migraine triggers. It’s known that menstruating women have more migraines than men, so estrogen has long been a suspected factor in migraines (testosterone, meanwhile, appears to protect against headaches — male privilege? ), but this is the first look at how the effect of estrogen on the trigeminal nerve impacts migraines. Why Does This Matter for My Health? Migraines are tough to treat, and can be debilitating for many people. If you suffer from chronic migraines, you know that your options are often very extreme — Botox, steroids, injections — or completely ineffective, or both. Now, there’s new hope for more natural treatments. Even if you don’t suffer from migraines, understanding the role that your menstrual cycle plays in headaches and other ailments can make that time of the month more manageable. It also explains how a lot of estrogen-mimicking and hormone-disrupting chemicals in our food, water, and environment may play a role in increased rates and severity of migraines. The WellBe Takeaway: The effect of hormones on migraines is complicated, and we definitely need more research to understand it; plus, these findings rely on lab and animal studies, which don’t necessarily translate to humans. Still, it’s promising, and a helpful reminder that our hormones play a major role in both long- and short-term health — so even if you don’t have migraines, tune into your body and stay on top of hormone imbalances to prevent chronic health issues. What: Two pieces of encouraging news show that hospitals are getting clued into the importance of diet for health: in California, a new law requires hospitals to provide plant-based options at every meal; and a new study shows that healthy meal delivery helps reduce 30-day hospital readmission. The Details: Governor Jerry Brown recently signed into law a bill that guarantees hospital patients a healthy, plant-based option at every meal. Anyone who has worked in or stayed in a hospital knows this is huge! This comes a year after both the American Medical Association and the American College of Cardiology called on U.S. hospitals to provide plant-based meals for patients, staff, and visitors. The law hopes to give options to those fighting heart disease, diabetes, and obesity, as well as those who adhere to vegan and vegetarian diets. It also promises to reduce costs, as most vegetarian meals are about half the cost of meals containing meat. Meanwhile, a new study showed promising results when personalized, low-sodium meals were delivered to the homes of patients after they were discharged. In the study, 66 patients who had been hospitalized for heart failure were given pamphlets on how to follow a low-sodium diet. Half of them received weekly delivery of meals that followed the DASH (Dietary Approaches to Stop Hypertension) diet. Patients who received the customized meals were less likely to be readmitted to the hospital within 30 days, and those that did return spent fewer days there than patients who didn’t get the meal delivery service. Hospitals who can reduce “LOS” (length of stay) and 30-day readmissions for chronic conditions get a reward from the federal government, so you’d think they would have been offering these meals years ago. (Face palm). Why Does This Matter for My Health? Both of these pieces of news show how important diet is for maintaining optimal health. It’s something that you should keep top of mind even when you’re feeling good, and certainly think about when you’re feeling bad. Many of us have been programmed to turn to a pill or some other quick fix when something doesn’t feel right, but focusing on diet instead can often reduce symptoms and prevent future ailments. The WellBe Takeaway: We always advocate bringing up diet with your doctor — and have heard many discouraging stories of doctors brushing off the topic as irrelevant. These news pieces show an encouraging shift toward more holistic thinking in hospitals, and we’re hopeful that more health care providers will get clued into the power of food as medicine. What: The chief medical officer at Memorial Sloan Kettering Cancer Center has resigned amid revelations that he failed to report millions of dollars from pharmaceutical companies. The Details: Dr. José Baselga, one of the world’s top doctors in breast cancer research, failed to disclose millions of dollars in payments from drug and health care companies in recent years, during which time he had dozens of research articles posted in prestigious publications like The Lancet, headed prominent groups such as the American Association for Cancer Research, and gave speeches and recommendations on the effectiveness of new drugs and devices. In reporting by the New York Times and ProPublica, it was found that he failed to disclose any industry relationships in 60 percent of his articles since 2013, with the number increasing with each passing year. To give a sense of how this played out, at a conference this year, Baselga put a positive spin on the results of two Roche-sponsored clinical trials that had widely been considered disappointments. It was only later disclosed that he’d received more than $3 million from Roche in consulting fees. His behavior and lack of disclosure underscore how fuzzy the boundaries are between academic research and industry, and the lack of enforcement in place to keep such things from happening. Why Does This Matter for My Health? Outside interests can have a major impact on the way that studies are designed, which drugs receive funding, and — scariest of all — how medications are marketed to doctors and prescribed to patients. That means that lucrative consulting fees (or, let’s just be real and call it bribes) could be what determines your doctor’s advice, not your health. The WellBe Takeaway: Unfortunately, we’re well aware of the mixed motivations and corrupt influences in the medical industry, which is why we encourage you to be your own advocate, do your own research from many different reputable sources, and ask your doctor lots of questions. To minimize the risk of working with doctors who may be receiving money from big pharma, it’s also a good idea to seek out a holistic or integrative doctor. What: The EPA has been busy — mostly undoing regulations that protect the environment (and our health). Some recent moves include weakening regulations of coal plants, relaxing requirements for dealing with methane leaks, and re-assessing the use of asbestos (which has recently been found in children’s school supplies!) in consumer products. On a positive note, an appeals court overturned the EPA’s denial to halt the use of a toxic chemical on food crops. The Details: Acting EPA administrator Andrew Wheeler signed a plan to weaken existing regulations of coal plants. This is one of the most significant rollbacks of President Obama’s climate change legacy. The proposal, called the Affordable Clean Energy rule, is meant to replace the Obama-era Clean Power Plan, which was designed around reducing greenhouse emissions. We care about this because the greatest source (42%) of all mercury pollution in oceans, streams, lakes, and fish is from coal-fired power plants. And that’s according to the EPA. The irony is strong to quite strong here. And the rollbacks just keep on rolling, with a proposal recently released that aims to relax requirements for how energy companies monitor and repair methane leaks. The move would make it easier for oil and gas companies to release methane into the atmosphere sans consequence, and allow companies to go longer between inspections. All of these rollbacks are being done in the name of reducing “excessive regulatory burdens,” according to Wheeler. Top officials at the EPA pushed through a measure to review applications for use of asbestos in consumer products. Internal emails show that this was not a unanimous decision, as the EPA’s in-house lawyers and scientists protested the measure. The need to completely ban asbestos is clear: a public interest group recently revealed that it had found traces of asbestos in children’s crayons, along with benzene, another carcinogen, in dry erase markers. In their report, they tested 27 common school products, and found that four of them contained toxic chemicals — that’s almost a quarter! The crayons in question were made by Playskool, which is owned by Hasbro; the markers were produced by The Board Dunes, a division of Mattel. Both makers have said they take the claims seriously and are re-reviewing all of their products. In better news, an appeals court overruled former EPA administrator Scott Pruitt’s denial to halt the use of chlorpyrifos on food crops. Pruitt’s ruling had overturned an earlier Obama-era ban on using the chemical in food or household settings. The appeals court ordered the EPA to institute a ban within 60 days, saying they had failed to provide a counter to scientific evidence that the chemical causes neurodevelopmental damage in children. Thank you appeals court, love children and parents everywhere. Why Does This Matter for My Health? We’ve said it before and we’ll say it again: the health of the environment affects our own health. How could it not? Every breath we take, product we buy, food item that we eat, home that we live in — they are all derived from the environment, and they pass their health onto us. That means that all of these EPA rollbacks can be seriously dangerous. Fewer coal and methane regulation means lower air quality, while increased incidence of asbestos raises the risk of dangerous cancers, like mesothelioma. Chlorpyrifos, meanwhile, has been shown to damage kids’ brains. The WellBe Takeaway: While we may not be able to control what goes on in the EPA (though we can make our voice known by writing our congress people and voting! ), we do have some control over our exposure to these chemicals. That’s why we always choose organic foods and household products, read labels, and are wary of anything made in mass production. What: The FDA approved the first ever digital app to be marketed as a contraceptive. The Details: The app, Natural Cycles, was created by a Nobel-prize-winning nuclear physicist, in partnership with her husband, after they were unsatisfied with the lack of non-hormonal options available. The app uses data such as sperm survival rates, body temperature, and menstrual cycles to predict a woman’s fertile days, and requires that the woman take her body temperature every morning. Based on this data and the temperature, the app will tell the woman whether it’s safe to have unprotected safe, or if there’s a risk of pregnancy. Today, only 1-3% of women use fertility awareness as a contraceptive, but one in five would consider it an option if they knew more about it. Why Does This Matter for My Health? The hormones in most contraceptives can seriously throw your health out of whack. From less serious side effects like mood swings, weight gain, and fatigue, to more concerning and long-term hormonal imbalances, many women sacrifice a lot just to ensure they don’t get pregnant. While a non-hormonal IUD exists, this isn’t the right option for many women, as there can be side effects from having a foreign object in the body — and so the Natural Cycles app is a big deal. It’s affordable and accessible to everyone, and to receive the FDA stamp of approval, it has to have been proven effective. The WellBe Takeaway: This is exciting news for getting added hormones out of our lives. However, it’s important to remember that the app needs to be used extremely carefully and correctly in order for it to be effective. We’re keeping our fingers crossed that this approval is followed by a robust educational campaign to make sure women everywhere know exactly how to use the app to ensure they don’t end up with an unwanted pregnancy. Don’t have time to read this whole wrap-up? Listen to it in our latest podcast episode, read to you by Adrienne! Enjoy listening to it while you commute, clean, walk, shop, work, or whatever — and don’t forget to subscribe, rate, and review our podcast! It helps a lot.